Click on the map above to see how much smaller the middle class is in your state. The middle class is on the decline in every state ... in size, anyway. The percentage of households considered middle class shrunk nationwide between 2000 and 2013, a state-by-state analysis by Pew Charitable Trusts' Stateline news site found. Wisconsin had the biggest loss, with the share of middle class households plummeting 5.6 percentage points to 48.9%. In Wyoming, meanwhile, the share of middle class families slipped only 0.3 percentage points to 51.2%. 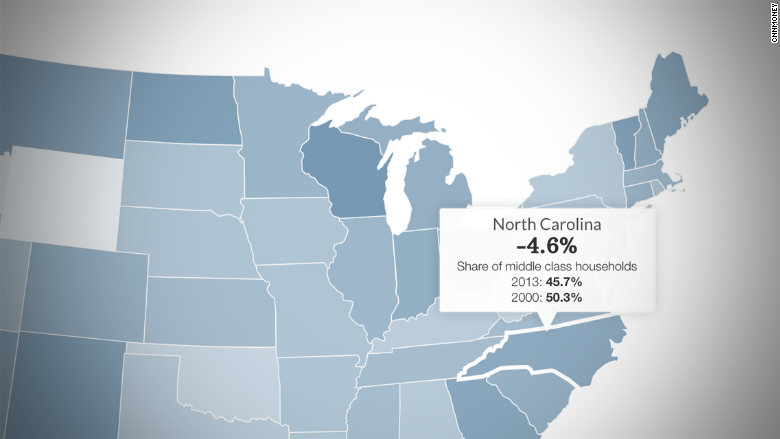 Related: How has the middle class fared in your state? Stateline defines the middle class as those making between 67% and 200% of the state's median income. Most states saw median incomes fall between 2000 and 2013, an ominous sign for the well-being of the middle class. But a smaller middle class is not necessarily a bad thing. It depends on where the former members of this group are going -- up or down the economic ladder. A separate Pew Research Center study shows that the share of adults in middle-income households has fallen from 61% in 1970 to 51% in 2013. But many are moving up. The share of upper-income households grew from 14% to 20% in that time period. Low-income households, meanwhile, narrowed from 29% to 25%.